How to fund the MCPS mistake? Raise taxes! MoCo politicians already have a plan for how to pay for correcting their portable classroom mistake: Raise taxes. 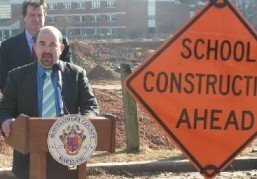 County Council President George Leventhal (D-At large), "said the county should be able to pay for the effort, provided that property assessments continue to increase and drive up tax revenue," according to the Washington Post. "'We’re publicly sticking our necks out here,' Leventhal said . . . ."
Not that Leventhal’s opponent, supersized Republican Steve Abrams, has a better plan. Indeed, Abrams boasts that he has sided with the Democrats - outgoing County Executive Doug Duncan (architect of trying to turn Seven Locks Elementary into a high-density housing development), lame duck County Councilman Steve Silverman, and defeated County Councilman Mike Subin – on such issues. Leventhal is no less partisan or freespending of other peoples' money than his comrades. But at least he has made steps toward trying to rein in the profligate spending of the board of education and superintendent. Abrams, for his part, sided with Silverman and Subin. Don’t be fooled by the party label. On tax-and-spend issues, there’s no real difference between Leventhal and Abrams. Might as well pick the guy who respects the Inspector General. Reporters missed an important angle in covering Superintendent Jerry Weast’s choreographed propaganda blitz announcing his commitment to get rid of the hated portable classrooms in the school system. The real story is that he was repudiating his own policy. Weast has more than doubled the number of temporary classrooms from just over 300 when he arrived in 2000, to more than 700 by 2005. Currently, according to the Washington Post, MCPS children are crammed into 607 portables. Now, with a surge in parental opposition, loss of allies on the county council, and an expiring contract, Weast is suddenly re-inventing himself. Post turns MCPS propaganda into "news"
Now that the real reporters have been taken off the Montgomery County education beat, the Washington Post "news" section can resume the paper’s cheerleading for our Great Superintendent. Reporter Daniel de Vise writes a non-story appearing on page one of today's Metro section: "Taking Aim at Portable Classrooms: Montgomery Reveals Plan to Reduce Temporary Structures." The article is just a recycled press release from Superintendent Jerry Weast, with no attempt at fairness or balance. The article contains no comments critical of Weast’s policies that led to the cramped conditions. Not a word from parents, PTA leaders, or dissident School Board member Nancy Navarro (who has been on top of the problem for years but whom the Washington Post editorial page opposes for re-election because she is “insufficiently supportive” of Weast). Doctor Jerry to the rescue! "The increase in portables at Montgomery schools has brought a corresponding surge in complaints from parents, who disparage the structures as cramped spaces with creaky floors and stale air. "Weast, touring some portables yesterday with other officials, pointed out additional problems: Portables put students far from bathrooms and fountains, and they require repeated trips outdoors in bad weather. They eat up campus space. They leave children more exposed to security threats." Superintendent Jerry Weast has reversed himself again – this time on the growth of the Montgomery County public school population. Weast and the Board of Education insisted that the public school population was going to continue to increase, which was one of their reasons for trying to run over the Seven Locks community by demolishing their school, turning the land into a high-density housing development, and building the triple-sized Kendale school a mile away on a wooded wildlife habitat. Community leaders were outraged, saying that Weast and the county had the demographic trends wrong, and that "said it was time the Montgomery school system moved away from relying on temporary classrooms," the Washington Post reports. "School enrollment has declined a bit this fall, from 139,387 to 138,520, based on preliminary data. 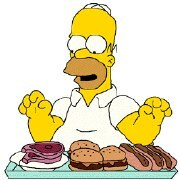 He says he expects two to three additional years of flat growth after 20 years of steady gains." "A brief lull in enrollment growth – driven by a slowdown in immigration, prohibitive housing costs and other factors – offers 'a propitious time to get rid of these mobiles,' Weast said, speaking at a morning news conference at Takoma Park Elementary School. 'We won’t have it again. . . . But we have it now. Let’s take advantage of it.'" The Washington Post reports on the propitious timing. Readers won’t find it in the Post, since the good reporters were taken off the beat, but it looks like the “propitious” timing that motivated the superintendent to do something about the portables has more to do with his expiring contract and less to do with county demographics. Weast did nothing about the portables until he realized that local communities would no longer allow him to operate with impunity. He was shocked that the County Inspector General would dare take documented complaints from the peasant population and actually find out that the allegations were not only true, but were understated! He and his cronies (School board member Steve Abrams prominent among them) decided they would ignore the Inspector General’s recommendations and would attack the merits of the report itself. Then, Weast found that the restless peasants at Seven Locks were actually making headway on the County Council and in the local media by exposing his misguided and possibly corrupt Kendale plan to turn the Seven Locks Elementary School into a high-density housing development and build a huge new school that nobody wanted. The County Council then came down against the superintendent and school board, killing the Kendale project and smacking Weast with another defeat. That followed with the electoral defeats of Weast-backer Steve Silverman in the County Executive primary in September, and Democrat voters’ repudiation of 20-year County Council Education Committee Chairman Michael Subin – the only incumbent thrown out of office in the primary. Now, Weast is facing calls for the county to refuse to renew his $350,000-a-year contract before it expires in a few months. So his timing is quite propitious indeed. Even Weast’s school construction programs anticipated the mushrooming of more portable classrooms. As Jerryweast.com reported last May, the superintendent and school board included five new portables in the controversial Kendale Elementary School that would have replaced Seven Locks Elementary School. At MCPS direction, the architects incorporated the portables into the blueprints. A loyal reader of this blog disagrees with our portrayal of the October 25 meeting about adding bike paths and sidewalks on either side of a long stretch of Seven Locks Road, from Wootton Parkway southward to Bradley Boulevard. The reader - whose integrity is beyond question - is satisfied that the county is proposing the project for the right reasons, and is not stealthily trying to turn Seven Locks Road into a four-lane highway. The reader also speaks well of the county official responsible for the plan. Seven Locks manhattanization plan continues? It looks like the Montgomery county bureaucracy is pressing ahead to manhattanize the area between Rockville and River Road. Recently the Department of Public Works and Transportation (DPWT) held a meeting at The Heights School for public comments on a proposed widening of Seven Locks Road between Wootton Parkway and Bradley Boulevard. The plan is called the "Seven Locks Road Sidewalk & Bikeway Facility Planning, Phase I Study." Officially, the initiative is to add sidewalks and bike paths along the east and west lanes of Seven Locks Road from Wootton Parkway in Rockville to Bradley Boulevard in Bethesda. But citizens at the meeting feared that the plan is really a ruse to clear out the easements on either side of Seven Locks and turn the road into a four-lane highway. They noted that the southern terminus of the project is Seven Locks Elementary School (SLES), and wondered aloud why the project would not logically extend the remaining 1.4 miles to River Road. "It's because the county doesn't want to rile up the Seven Locks community just yet," said one participant of the event. Some taxpayers noted the artwork that DPWT developed to illustrate the form. Captioned, "Step Into The Plan Ahead," the artwork features a humanoid figure between two two-lane roads, surrounded by metropolis-style high-rise buildings. The project manager is Aruna K. Miller. Tel: 240-777-7194. Fax: 240-777-7277. Email: aruna.miller@montgomerycountymd.gov. At the recent public meeting on the widening of Seven Locks Road, Montgomery County officials distributed a "Public Comments Form" for citizens to make their views known in writing. The form gives taxpayers a deadline of Friday, October 13, 2006, to send in their written comments. That's a rather difficult task for even the most civic-minded person, because the officials handed out the forms on October 25. An honest bureaucratic mistake? Or was it, perhaps, a setup for the future, so that the county can claim that it received no public opposition by the deadline? Go to www.Mapquest.com, punch in Seven Locks Road, Bethesda MD, and click on the "Aerial Image" icon at the top right corner of the website. That will give you a satellite photo of Seven Locks Road. Zoom in, and it's easy to see why central planners would want to clear away the easements on either side of Seven Locks to make room for a future four-lane highway. "It's pretty obvious what they want to do," says a Seven Locks resident who attended the October 25 meeting. "They want to widen Seven Locks as they have already done at its northern end by the Wootton Parkway and at the Democracy Boulevard intersection. "It's the Kendale scandal all over again. They want to sneak this on us under the guise of nice, homey sidewalks and bike trails." Scroll down the Seven Locks satellite image until you see a large, tan roof with a courtyard in the middle and a baseball diamond to the left. That's Seven Locks Elementary School, where the widening project would end. The cross street is Bradley Boulevard. Now look at Seven Locks to the south of Bradley. It becomes a funnel for southbound (morning commuter) traffic. Unwise for central planners to clog a newly widened four-lane road south of that busy intersection. With that handy dump onto River Road and the Beltway just a mile and a half south, the next widening project is obvious. He brags on his website of his "political savvy," then boasts of his ties to the only local politician whom voters booted out of office last month: County Council Education Committee Chairman Michael Subin. Steve Abrams, the Republican school board member who is running for the County Council's at-large seat, calls himself part of the Democratic team that's now leaving office. He says he wants to continue their legacy. Abrams says on his homepage: "All of this has been accomplished because Doug Duncan, Mike Subin, Steve Silverman and Steve Abrams shared a vision. That vision has been implemented under the able leadership of Superintendent Jerry Weast and the collaborative efforts of the Board of Education, the County Executive and the County Council to make sure it was properly funded. "Doug Duncan, Mike Subin and Steve Silverman are leaving office," the website says. 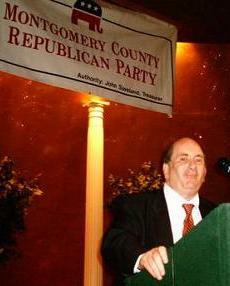 And Steve is just the Republican to be their standard-bearer: "Montgomery County needs Steve Abrams on the County Council to make sure this effort is continued!" In one of the more odd matches in American politics, supersized Republican County Council at-large candidate Steve Abrams brags that he was once Deputy Assistant Secretary of Agriculture for Food. His full title, bestowed by President Bush, was Deputy Assistant Secretary of Agriculture for Food and Consumer Services. See for yourself! Go to Steve's homepage, www.abramsformontgomery.com and click on the "Successful Management Experience" icon. County Council candidate Steve Abrams, who served as a senior Republican staffer in Congress and was a political appointee under President Bush, is hiding his ties to the GOP. His campaign website brags about all the positions he's held in the federal government, but says nothing about his lifelong Republican activism and party loyalty. Abrams isn't just downplaying his party affiliation like other Republican candidates. He's trying to hide it. But then, such sneakiness is nothing new to those of us who have known him over the years. Rather than soil its britches about the Montgomery Blair High School principal's color-coded security plan, the Examiner says in an editorial, "Montgomery County should save its outrage for a far more hideous embarrassment: An Oct. 18 memo by MCPS Superintendent Jerry Weast informing the county that school administrators at eight high schools illegally changed grades for 46 varsity athletes academically ineligible to play. Notably, the list does not include Montgomery Blair. "Here’s betting that every single student at Einstein, Bethesda-Chevy Chase, Winston Churchill, Quince Orchard, Walter Johnson, Watkins Mill, Wheaton and Walt Whitman high schools can see right through that one, too." Our superintendent is is trying to empower himself and his lame-duck school board cronies even further against local communities. Now the Weasties want the power to deny the local communities from having a say in how their public schools are named. Word is that their first action will be to take their long-promised revenge against Seven Locks Elementary School. Some say that Weast wants to name it after his defeated County Council ally Michael Subin. According to a recent MCPS notice, "The Board of Education has requested community comment regarding its revised Policy FFA, Naming School Facilities, which provides a process by which the Board of Education adopts official names for county public school facilities after soliciting community preferences. "The revised policy would allow the Board to notify the community of its intent to designate a school name and waive the process for community involvement under certain compelling circumstances. Copies of the draft policy are available through the Public Information Office by calling 301-279-3391 or at the link below [www.montgomeryschoolsmd.org/info/pdf/FFAcomment.pdf]." "Compelling reasons" to block the community from helping decide the name of a local school? Sounds like some railroading's in store. Gratefully, The System is letting the peasants comment until December 15, to the Office of the Superintendent of Schools, 850 Hungerford Drive, Rockville MD 20850. According to MCPS, "the responses will be shared with the Board of Education." A Montgomery County judge singled out MCPS and the school board for the policy of letting an armed robber play for a second public school team after the principal of his own school wanted him expelled. "I think a lot of the citizens feel the same way, that it's a disgrace to the public education system in the county for the school board or the principal or whoever is in charge to allow him to play football," Judge Paul H. Weinstein said at the sentencing hearing of a county high school athlete who was convicted of armed robbery. The Washington Post carries the story. 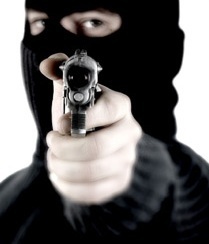 First, MCPS lets armed robbers play football at county high schools. Now we learn that in at least eight county schools, officials illegally changed athletes' poor grades so they would be eligible to play on varsity teams. Superintendent Jerry Weast sent around a tough-sounding memo on October 18, decreeing that the teams would forfeit the games in which the illegal students played. MCPS Chief Operating Officer Larry Bowers identified eight schools that illegally changed the grades of 46 athletes. Weast said the athlets would be kicked off the teams and have their poor grades restored. The Montgomery Blair High School online paper Silver Chips reports, "The schools affected were Bethesda-Chevy Chase, with five ineligible students; Winston Churchill, with two students; Einstein, with 24 students; Quince Orchard, with two students; Walter Johnson, with three students; Watkins Mill, with six students; Wheaton, with three students; and Walt Whitman, with one student." The Washington Post quotes Weast as saying in the memo, "The review makes it clear that we must look at our processes and work to improve them so that we can avoid a repeat of this situation." So now we find that, according to MCPS policy, kids who drink a can of beer will be kicked off the team along with the lousy students with fake grades. But armed robbers can still play. The Weast has spoken: There can be no individual accountability in Montgomery County Public Schools. The innocent must pay for the misdeeds of the few. Rather than holding individual students and faculty accountable for the grade scandal, MCPS is meting out collective punishment against all the athletes and, by extension, all the schools. The Weast has decreed that entire teams must forfeit the games in which the dishonest students played - even though there were only one or two bad apples in some of the schools. Even though, as MCPS Chief Executive Officer Larry Bowers readily admits, 99.5 percent of the student athletes are innocent. 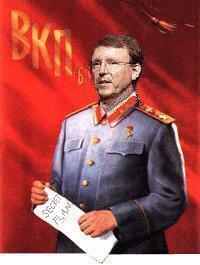 And Weast expects county parents to support renewing his $350,000-a-year contract until 2014? "Board of Education member Valerie Ervin alleged that the scandal is wider than the Weast memo suggested," Montgomery Blair High School's online newspaper Silver Chips reports. "I'm telling you, all of the schools that are breaking the rules are not on there. Check Kennedy, check Sherwood. This is a huge scandal," said Ervin. Here's a freaky fact about the Jerry Weast slate for the Montgomery County Board of Education. The slate is 100 percent white. This blogger doesn't believe in quotas or discriminating against (or for) anyone based on ethnicity. But it's more than a little ironic that the MoCo progressives who harp and carp about diversity are OK with keeping minorities off the school board. A Washington Post editorial today gives us the slate of Montgomery County school board candidates who, apparently in the editors' view, would keep Jerry Weast as superintendent until 2014. The Post strongly backs Weast for another seven-year term. The Weast slate: Shirley Brandman to replace at-large member Charles Haughey; Judy Docca to replace Gabe Romero in District 1; and lawyer Phil Kauffman to oust Nancy Navarro in District 5. Thrown out by voters in the September Democratic primary, County Councilman Michael Subin has applied to become president of Montgomery College. "It’s no deep dark hidden secret that [the college] has been a favorite institution of mine," the 57 year-old politician tells the Gazette. "They’re an incredible gift to the county. And if I could take my gift and help them out ... it’s an incredible institution." He'll take that gift to the tune of $192,379 a year plus a tax-sheltered retirement package, according to the report, if he receives the same pay as the current Montgomery College president. Presently, Subin takes $79,721 a year as a taxpayer-funded councilman salary. By happy coincidence, the voters rejected Subin just as Montgomery College President Charlene R. Nunley prepares to move on. Subin insists he wasn't looking for the job. "That’s not any of my doing," he says about the timing. "[But] if a bluebird lands on your shoulder, you kind of pet it and give it some bird seed." Looks like there might be life beyond December for www.michaelsubin.com. . . .
No surprise here, but for the record, School Board member Patricia O'Neill, who is running unopposed for re-election, says she plans to re-hire controversial Superintendent Jerry Weast. O'Neill and supersized Steve Abrams of Rockville "are the only holdovers from the board that hired Weast, whose contract renewal will be one of the first big issues for the new board," the Gazette reports. Says O'Neill: "I stand as committed to rehiring and re-upping him as I did when we hired him in ’99." Good for School Board member Pat O'Neill. Unlike most politicians, she readily acknowledges to the Gazette, "I have to be honest." An innocuous preface to an innocent comment, but a nice reminder just the same. The MCPS superintendent likes to brag about numbers, but there's one set of figures he's ignoring: the fact that disabled white students score five times higher than their minority counterparts do. Lyda Astrove of MCneeds, a Montgomery County nonprofit that advocates for the disabled and their families, writes in the Washington Post, "Mr. Weast needs to explain why almost half of white students with disabilities pass the English 2 Maryland High School Assessment but only about 1 in 10 African American and Hispanic students with disabilities do so." "Expanding early childhood programs, funding smaller classes and providing all-day kindergarten are feel-good initiatives that have enticed Montgomery County politicians to jump on the Jerry D. Weast bandwagon," Lyda Astrove of Rockville writes in the Washington Post. "Unfortunately, Mr. Weast, the superintendent of the Montgomery County public schools, hasn't shown exceptional leadership with regard to the county's exceptional students: the more than 17,000 children who receive special education services. "These students haven't shared in the gains, probably because increases in special education funding have gone to cover only enrollment growth and have not been used to provide meaningful improvements to services." "The Montgomery school system has one of the worst records in the state on placing special education students in the least restrictive environment, and Mr. Weast's own numbers show that fewer of those students are 'college capable' than when he got here," Lyda Astrove continues in her Washington Post letter. "Given that passing scores on the HSAs will soon be required for a high school diploma, somebody needs to do some "intrusive meddling" to ensure that students with disabilities receive the services they need to prepare them to pass those tests." Do the superintendent and school board really give a hoot about black kids? SAT scores show that the Montgomery County Public Schools system is keeping black kids down while white kids continue to achieve. Much of the reason is due to the MCPS policy of forbidding minority families from using vouchers to place their kids in better schools. "The terrible irony is that by keeping parental choice out, opponents trap minority students in underperforming public schools that have exhausted millions of tax dollars for decades on failed efforts to close the academic achievement gap. Year after year, minority kids are cheated out of good educations," according to the Washington Examiner. "In the Montgomery County Public Schools, for example, the average mean SAT score for black students during the last two years of Superintendent Paul Vance’s tenure was 216 points lower than the score for white students. 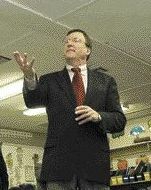 By the second year of current Superintendent Jerry Weast’s reign, the gap increased to 238 points. By Weast’s fifth year, the gap was up to 246 points. For the current year, the gap is 254 points." The Examiner editorial, published October 6, continues: "The situation is similarly discouraging when the performance of black male students is compared with other student groups within MCPS. On the Maryland State Department of Education English Proficiency tests, 63.7 percent of black males in MCPS scored at only the basic proficiency level of achievement. That’s actually lower than the 67.2 percent of black males scoring at Basic Proficiency in Prince George’s County Public Schools. "Weast rightly touts increased SAT participation rates for MCPS minority students, but the bottom line on scores is getting worse, not better. Clearly, it’s time for some new thinking and approaches, which is most readily encouraged when parents have more choices about their where their children go to school. 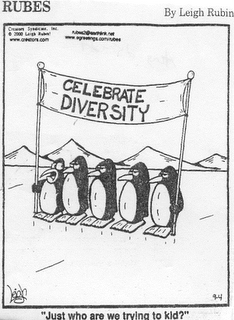 That such choice also appears to result in more, not less integration is the added bonus." The student paper at Montgomery Blair High School points out another absurd MCPS policy. Student athletes who drink alcohol are banned from sports for an entire year, but students who commit armed robbery get to play for MCPS teams. "Currently, there is no county-wide code of ethics that punishes students fairly and consistently based on their offense," student Justin Vlasits writes in Silver Chips Online. 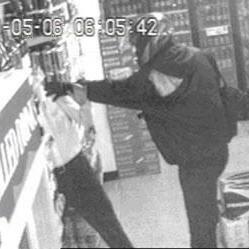 Underage drinking is a major community issue, but it pales in comparison to the seriousness of armed robbery." Montgomery County parents - please help this man! His name is Fred Hiatt. He's a good man. But he needs help. Fred is editorial page editor of the Washington Post. He's friendly and open-minded. He's tough but fair. He's a good newsman. But he's befuddled about something, and he needs all of us to give him a hand. 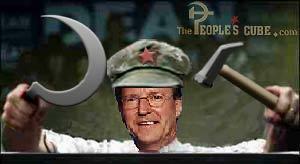 You see, Fred can't figure out why so many parents in Montgomery County are so upset about Superintendent Jerry Weast. 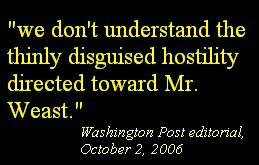 He said so in his October 2 editorial (see below). Perhaps Fred doesn't read the stories of his own reporters who cover Montgomery County. Perhaps he can't know because the Post news editors keep reassigning their Montgomery County correspondents who start digging into the nastiness of MoCo politics. Or maybe he doesn't read all the stuff in the Washington Post-Newsweek Corporation-owned Montgomery Gazette. Fact is, being editorial page editor of the Post is a huge job and he can't be expected to know everything. So let's cut him some slack for the time being. Here's the deal: We can help him out by keeping him informed by email. His main email address is fredhiatt@washpost.com. Here's another easy way for Washington Post editorial writers to de-mystify what they call the "thinly disguised hostility" directed at our marvelous school superintendent. They can read the community newspaper that their company owns: the Gazette. More often than not, the Gazette runs letters to the editor and guest opinion pieces from ordinary members of the community who are angry, outraged, or just plain demoralized about the superintendent and his policies. Also in this issue, public school mom Beth McLean of Gaithersburg expresses a years-long "rage" about MCPS. "I have been in a rage for the past several years regarding the school system’s calendar," she writes in response to a September 13 op-ed by Peter Dressner. "I comment to parents, co-workers, neighbors, even my children. 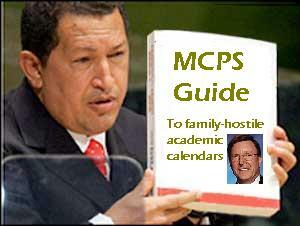 The Montgomery County Public Schools’ calendar is flatly 'a nightmare!'" "Mr. Dressner," Mrs. McLean continues, "you could not have written your point more articulately. I know that there are thousands of other parents who feel the same way we do. I have spoken with dozens of them myself." I bet the Post editors could, too. Last week, Marla Neustadt of Bethesda wrote a letter expressing similar opinions, advising school board candidates to take heed to public anger. And then, there's Peter Dressner's original contribution that kicked off the start of a new school year. The Bethesda dad took the trouble to compare the MCPS calendar with those of other school districts, and found: "After comparing about 30 schools with MCPS, I have come to the conclusion that MCPS has without a doubt the most family-unfriendly and meanest academic calendar in the United States." Gotta read Dressner's piece, folks! Click here for the full text from the Gazette. The Montgomery County Public Schools system is dumping so much excessive work on the kids that it's "turning schools into factories to produce the next generation fo economically viable robots." That's how Ginger Baran of Bethesda sees it in a letter to the Gazette. The "school system's policymakers, administrators and hyper-competitive parents are making decisions with blatant disregard for the needs of the children and the true value of education as a life-long experience of interacting with the world," she writes. "Elementary school students do not need college prep; they need developmentally responsive, engaging instruction that invites them to read a novel, conduct a science experiment or play a musical instrument for the sheer pleasure of learning. "The International Baccalaureate program inundates high school students (and now, apparently, preadolescents) with excessive homework, rigid course requirements and unwarranted academic pressure, with the ever-illusive concept of 'college readiness' as the ultimate goal. . . .
"Shaping a child's entire life around the criteria on which he or she will be judged by college admissions counselors is disgraceful, even abusive." Our trusty public school officials are going to start "sharing information" with the community about their plans to build a new Seven Locks Elementary School on the present site at the intersection of Bradley Boulevard and Seven Locks Road in Bethesda. The first meeting is on Thursday, October 5, at 7:00 pm, in the Seven Locks Elementary School gym. The community will be there in full force, with recorders and video cameras, to document any shenanigans on the part of the officials. Check your pitchforks at the door. Washington Post editors devoted a third of their space today to an editorial in support of Superintendent Jerry Weast - giving signs that they fear his demise as head of Montgomery County Public Schools. * Weast's loss of his "reliable partnership" with retiring County Executive Doug Duncan and ousted County Council Education Committee Chairman Michael Subin; and "reliable backer" Steve Silverman, whom voters rejected to replace Duncan. * Public calls for greater scrutiny of the school system. * Weast's own secrecy and the lack of transparency under his administration. * The public's "thinly disguised hostility" toward Weast. * The fact that he "comes across" as a bully. * Public outrage over his $350,000-a-year salary and tax-dodge perks. The editors tip their hand at the beginning of the editorial, when they note how the upcoming "marked changes in Montgomery County's political leadership" are likely to affect our "hard-charging superintendent." They're trying to frame the issues for the campaign, noting that "none of the leading candidates for County Council or school board have come out publicly against Mr. Weast," then spend the last four paragraphs of the six-paragraph editorial explaining why the secretive superintendent is such a great guy. 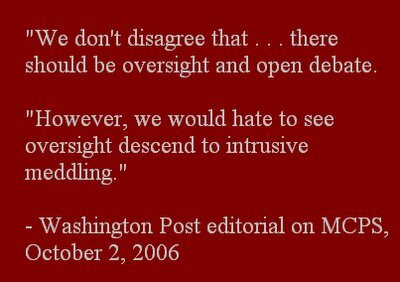 For a newspaper that broke the Watergate scandal and has been crusading and jihading against government secrecy since 9/11, it's odd for the Washington Post editorial page to come out so tepidly in support of transparency at Montgomery County Public Schools. Perhaps there's a story behind it. "While none of the leading candidates for County Council or school board have [sic] come out publicly against Mr. Weast, dissatisfaction has emerged under a clarion call for 'greater scrutiny' of the school system." "We don't disagree that, with more than half of the county's budget going to schools and given the importance of education, there should be oversight and open debate." "We don't disagree that . . . there should be oversight and open debate"? "However, we would hate to see oversight descend to intrusive meddling." This from the paper that just won a Pulitzer for its investigations of the rot on Capitol Hill and built its name on hard-core public accountability in government. It seems as if the Post editors are trying to protect Weast from their own rather independent reporters. Where's Ben Bradlee when you need him? They're journalists. Why don't they just ask? More feigned cluelessness from the Post editors about public dissatisfaction with our school superintendent. "Those who are implying dissatisfaction or complaining about insufficient oversight should answer openly: What is it they don't like about what he has done?" What an embarrassment for the editors of such a great newspaper to ask such a question. The critics have gone on the record time and again in the Post's very own pages. A Google search finds scores of on-the-record complaints, chronicled here on JerryWeast.com, that the laziest editor can find. To say nothing of the fact that the WashingtonPost.com contains more than 40 links to this blog. . . .
And there's an old tried-and-true method of journalism that the Post editors might want to re-learn: Go out and ask people what they think. One of the many funny things about today's Post editorial. They say Weast ought to "open up his decisions for discussion" (note the jargon here - to any other politician they'd tell him to stop the secrecy). But they say nothing about how Weast regularly avoids Washington Post reporters when they call for comment on public disappointment or anger about his policies, or about a scandal involving MCPS. He even avoids calls from reporter Lori Aratani, whom the editors quote in their opinion piece. Weast is only available to the Post when he thinks he's going to get praise. Not when reporters ask questions he'd rather avoid. You'd think editors would have a problem with that type of public figure. But then again, the Post seems to have a way of reassigning its reporters who get too close to digging up certain realities here in MoCo. Peasants! Ready your pitchforks . 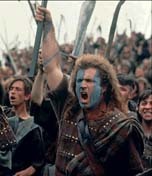 . .
Time to get out your pitchforks and prepare for another siege. MCPS has scheduled a series of feasibility study meetings at Seven Locks Elementary School. Officials will "share information" about the design process and project timetable to implement last May's school board decision to build a new school by 2011. The Seven Locks Coalition warns its members that "given the history of the school issue . . . we must stay vigilant and politically attuned - now that we know how fast our elected officials can shift course and since there are continuing reports of plans to close Seven Locks Elementary." We still hear rumors of revenge from the Weasties. So JerryWeast.com will remain active.